Back when one of the best paths to desktop 3D printer ownership was building the thing yourself from laser cut wood with some string thrown in for good measure, just saying you had one at home would instantly boost your hacker street cred. It didn’t even need to work particularly well (which is good, since it probably didn’t), you just had to have one. But now that 3D printers have become so common, the game has changed. If you want to keep on the cutting edge, you’ve got to come up with a unique hook. Luckily for us, [Thomas Sanladerer] is here to advance the status quo of desktop 3D printing. Not content with a 3D printer that spends its time loafing around the workshop, he decided to build a completely mobile 3D printer. For a guy who spends a lot of time traveling to different 3D printing conferences and shows, this is actually a pretty handy thing to have around, but there are probably some lessons to be learned here even if you aren’t a 3D printing YouTube celebrity. The most obvious addition to the PrintrBot is the six Sony NP-F camera batteries that [Thomas] attaches to the back of the printer by way of 3D printed mounts, but there’s also quite a bit of hardware hidden inside to break the machine free from its alternating current shackles. The bank of batteries feed simultaneously into a DC boost converter which brings the battery voltage up to the 12 V required for the printer’s electronics and motors, and a DC regulator which brings the voltage down to the 5 V required by the Raspberry Pi running OctoPrint. There’s even a charge controller hiding in there which not only frees him from carrying around a separate charger, but lets him top up the cells while the printer is up and running. On the software side of things, the Raspberry Pi is configured to work as a WiFi access point so that OctoPrint can be controlled with a smartphone even if there’s no existing network in place. A fact demonstrated when he takes the printer outside for a walk while it’s in the middle of a job. The ability to control the printer without any existing infrastructure combined with the estimated six hour runtime on a charge means this modified PrinterBot can get the job done no matter where [Thomas] finds himself. The hacker community was saddened by the news that PrintrBot was closing its doors last year, an unfortunate casualty of an increasingly competitive desktop 3D printing market. But perhaps we can take some comfort from the fact that their eminently hackable open source printers still live on in projects such as this. It is both nostalgic and sad to see the Printrbot headquarters all empty with quiet machines. [Brook] was always one of us and often gave back to the community and it is interesting to hear his perspective about what brought his company to an end. This is a link to Defcad, the repository of 3D printable files for weapons. Under an agreement with the US Department of State, Defcad was set to go online on August 1st. This caused much handwringing in the tech journalist thoughtspace, with reporters calling to end the first amendment because they don’t like the second. Alyssa Milano chimed in. Defcad was ordered shut down by a federal judge in the western district of Washington before going live. As you may well be aware, Printrbot ceased operations last month. It’s sad to see them go, but they made some acceptable machines and were really pushing the boundaries of what was possible with their infinite build volume prototype printer. But what about all those existing printrbots in the wild, you might ask. Well, good news for anyone who hasn’t changed their hotend over to an E3D yet: Ubis is going to be selling hotends. Get ’em while they’re hot (or not, I don’t know how this pun works). File this one into the ‘awesome government auctions’ category. The city of Longmont, Colorado decommissioned their tornado sirens last year because they ‘self-activated’ and malfunctioned. These sirens were put up for auction, with a winning bid of $526. Someone bought the most annoying thing imaginable for just over five bills. The world of government auctions is amazing. It’s with a heavy heart that we must report Printrbot has announced they are ceasing operations. Founded in 2011 after a wildly successful Kickstarter campaign, the company set out to make 3D printing cheaper and easier. Their first printer was an amalgamation of printed parts and wood that at the time offered an incredible deal; when the Makerbot CupCake was selling for $750 and took 20+ hours to assemble, the Printrbot kit would only run you $500 and could be built in under an hour. Printrbot got their foot in the door early, but the competition wasn’t far behind. The dream of Star Trek style replicators fueled massive investment, and for a while it seemed like everyone was getting into the 3D printing game. Kit built machines gave way to turn-key printers, and the prices starting coming down. Printrbot’s products evolved as well, dropping wood in favor of folded steel and pioneering impressive features like automatic bed leveling. In 2014 they released the Printbot Simple Metal, which ultimately became their flagship product and in many ways represents the high water mark for the company. Eventually, overseas manufacturers saw an opportunity and started flooding the market with 3D printers that were cheaper than what many would have believed possible only a few years earlier. Today you can go online and buy a perfectly serviceable starter printer for under $200, even less if you’re still willing to build it yourself. For an American company like Printrbot, competing at this price point was simply an impossibility. Rather than give up, Brook decided to take things in a different direction. If he couldn’t compete with imported machines on price, he would start building high end printers. A new version of the Simple Metal was introduced in 2016 with premium features such as linear rails and cloud-based slicing, complete with a premium price. From that point on, most new Printrbot products would release at over $1,000; putting them more in line with “prosumer” machines from companies like Ultimaker. For hacker types who got their first taste of 3D printing thanks to a cheap wooden Printrbot kit, this was something of a bittersweet moment. At the same time, Brook’s natural hacker spirit and love of the open source community lead to a number of interesting side projects that never quite got off the ground. Most recently, he’d been putting the finishing touches on the Printrbelt, a 3D printer with a conveyor belt in place of a traditional bed. Such a machine could finally bridge the gap between desktop 3D printing and true small scale production capability. When we saw Brook at the East Coast RepRap Festival, he brought along a new machine that the more cynical observer might have taken as foreshadowing. The Printrbot Easy was going to be a modified and rebranded FlashForge Finder, a final acknowledgement that the only way to compete with the Chinese manufactured 3D printers was to sell one of your own. It’s always sad to see a tech company go under, but seeing the end of Printrbot is especially hard. Built in America with locally sourced components and with a commitment to keeping their machines open source, there was a lot to love about the plucky little 3D printer company from Lincoln, California. Printrbot was the quintessential hacker success story, and we’re proud to say we’ve been in their corner from the start. 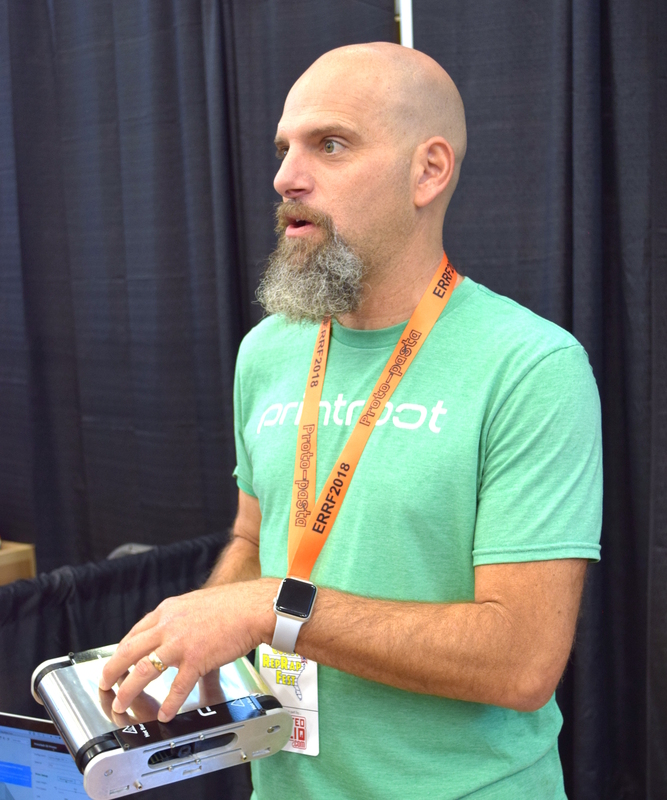 Here’s to wishing Brook Drumm and the entire Printrbot team success in their future endeavors; we’ll be keeping an eye out. If you’ve been hanging around 3D printing communities, or reading the various 3D printing posts that have popped up here on Hackaday, you’ve almost certainly heard of OctoPrint. Created and maintained by Gina Häußge, OctoPrint allows you to turn an old computer (or more commonly a small ARM board like the Raspberry Pi or BeagleBone) into a network-accessible control panel for your 3D printer. 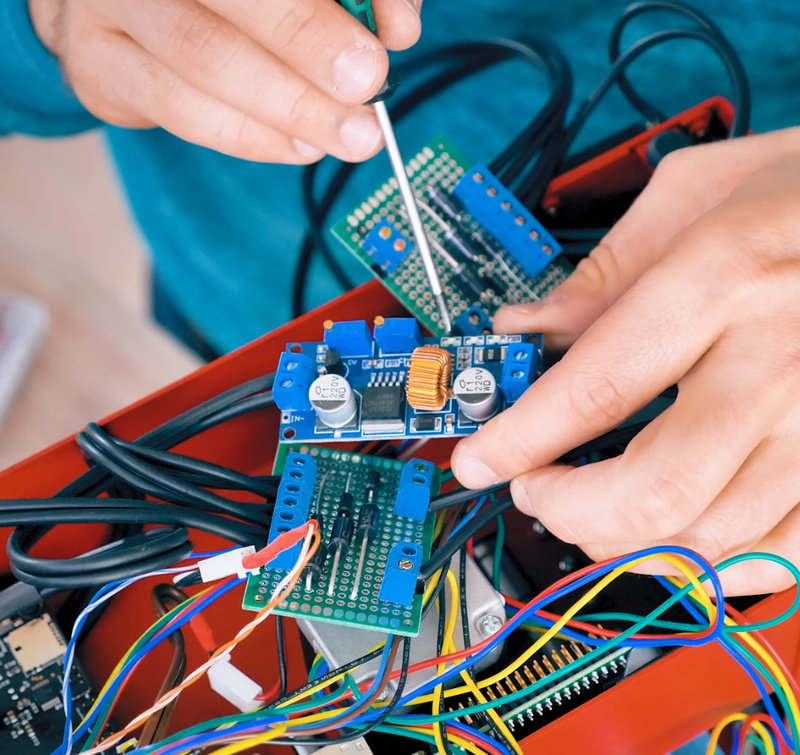 Thanks to a thriving collection of community developed plugins, it can even control other hardware such as lights, enclosure heaters, smart plugs, or anything else you can think to hook onto the GPIO pins of your chosen ARM board. The project has become so popular that the new Prusa i3 MK3 has a header on the control board specifically for connecting a Pi Zero W running OctoPrint. Even still, I never personally “got” OctoPrint. I was happy enough with my single printer connected to my computer and controlled directly from my slicer over USB. The majority of the things I print are of my own design, so when setting up the printer it only seemed logical that I would have it connected to the machine I’d be doing my designing on. If I’m sitting at my computer, I just need to rotate my chair to the right and I’m at my printer. What do I need to control the thing over WiFi for? But things got tricky when I wanted to set up a second printer to help with speeding up larger projects. I couldn’t control them both from the same machine, and while I could print from SD on the second printer if I really had to, the idea seemed painfully antiquated. It would be like when Scotty tried talking into the computer’s mouse in “Voyage Home”. Whether I “got it” or not, I was about to dive headfirst into the world of OctoPrint. [Brook Drumm] of Printrbot is teasing a new 3D printer. This is no ordinary 3D printer; this is an infinite build volume 3D printer, the Next Big Thing™ in desktop fabrication. The world was introduced to the infinite build volume 3D printer last March at the Midwest RepRap Festival with a built by [Bill Steele] from Polar 3D. The design of [Bill]’s printer began as simply a middle finger to MakerBot’s Automated Build Platform patent. This was patent engineering — [Bill] noticed the MakerBot patent didn’t cover build plates that weren’t offset to the plane of the print head, and it just so happened a printer with a tilted bed could also build infinitely long plastic parts. While [Bill Steele]’s unnamed printer introduced the idea of an infinite build volume printer to the community, a few pieces of prior art popped up in the weeks and months after MRRF. Several years ago, [Andreas Bastian] developed the Lum Printer, an unbounded conveyor belt printer. A month after MRRF, Blackbelt 3D introduced their mega-scale tilted bed printer and later started a Kickstarter that has already reached $100,000 in pledges. Right now, details are sparse on the Printrbelt, but there are a few educated guesses we can make. The belt of the Printrbelt appears to be Kapton film attached to some sort of substrate. 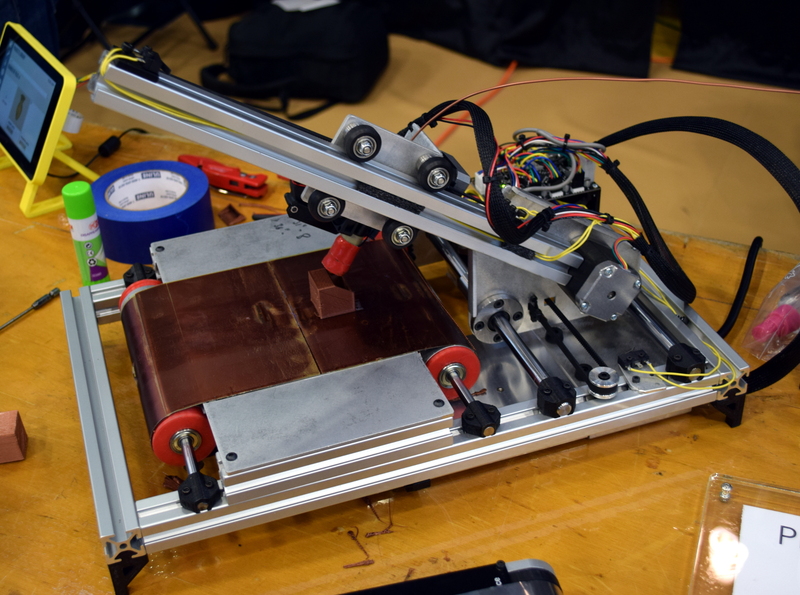 The hotend and extruder are standard Printrbot accouterments, and the conveyor is powered by a geared stepper motor. All in all, pretty much what you would expect. We do know that [Brook] and [Bill Steele] are working together on this printer, apparently with [Brook] in charge of the hardware and [Bill] taking either his slicing algorithm or firmware modifications (we’re not exactly sure where the ’tilt’ in the Gcode comes from) and getting this printer running. While the Printrbelt isn’t ready for production quite yet, this is a fantastic advance in the state of consumer, desktop 3D printing. You can check out [Brook]’s teaser videos below.